People often ask if mini pigs bite; we learned first hand that the answer is yes. Oscar has teeth on the bottom row which I call his “gopher teeth” that make a mini pig bite painful. Oscar went through a biting phase when he was around 6 to 8 weeks old. He generally bit for two reasons: to play or to show aggression. I did not want a mini pig who bit us, our dogs, or guests in our home, so I set out to stop the biting immediately. The playful mini pig biting happened when he would run up, bite our toes, and run off again. This was one of his favorite games for a while, and it was cute but still hurt when he clamped down unexpectedly. The fix for this took a few tries but was fairly easy. Each time he bit our toes, we reacted with a loud “ouch” or “no” so that he knew it wasn’t acceptable. We also gave him a toy to essentially replace the toe with an approved chewing option. We didn’t want him to think he couldn’t chew, but he had to chew on the right things. Over the course of a week, this consistent correction worked for the playful biting. The aggressive mini pig biting was more difficult to correct. When we tried to move him after a nap or tried to put his harness on, Oscar would whip his head around and try to bite. Sometimes he was warning us and wouldn’t clamp down, but I knew this was dangerous behavior and had to be stopped. We used the firm “no” and very lightly tapped him on the snout to try and stop the behavior, but this only had a slight impact. I decided to try a more positive correction, so we gave him cheerios to get him up from a nap and while we put his harness on, and that worked the best. Initially I thought giving him treats would reinforce his bad behavior, but this negotiation worked almost instantly to get rid of the biting and we haven’t had any biting issues for several weeks. One last thing to mention is that a common reason mini pigs bite is by accident when taking a treat or food from a person’s hand. To avoid accidental biting when feeding or giving treats by hand, place your hand flat on the floor with your palm up and either put the treat in your hand or between two of your fingers. This encourages the pig the take the food gently. When mini pigs are given treats from near or above their head, they learn what’s called “snapping” and can end up biting your hand or fingers when taking the treat. If you’re having biting issues with your mini pig, give these methods a shot and see if they work for you. You never want to let your mini pig get away with biting, even at a young age, as biting can become a serious behavior problem when your mini pig is bigger. 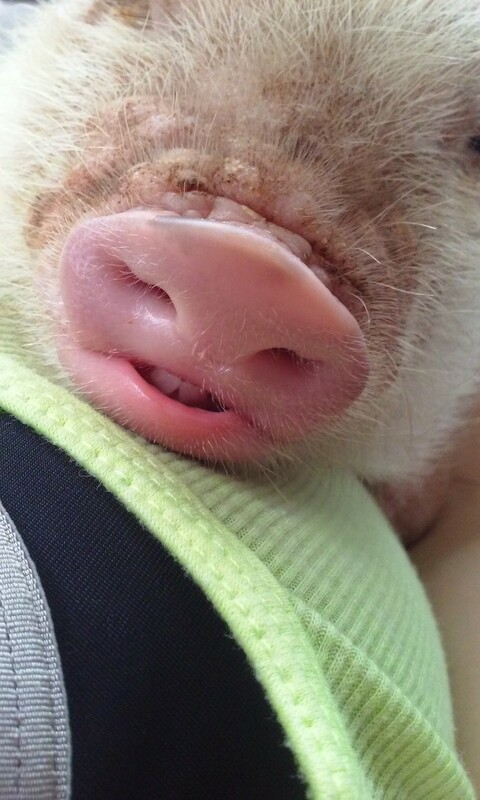 If you are dealing with a more serious biting problem, I recommend checking out this article from the North American Potbellied Pig Association (NAPPA). Part One discusses aggressive mini pig behavior and mini pig biting, and Part Two provides correction tips for more serious biting concerns. If you have any questions, feel free to leave them in the comments section and I’m happy to try and help. Update: After several months with no biting issues, Oscar is biting again. Read this post about his new biting issues and what we are doing this time to stop his biting. My mini pig is chewing the linoleum and carpet. Any tips on how to get him to stop doing this? Ive thought about spraying tobasco on areas hes after but dont want to hurt him. We just got our mini pig and we are all adjusting she is very sweet but also nervous she has nip at us serveral times and her teeth are very very sharp and really little on the top is that normal ? Thanks for your help!! Hello… My pig is approx. 3 weeks old we have been bottle feeding him but all he does is root on our arms. It sometimes hurts! I thought that maybe that is what they do to their mothers but I was wondering if you had any suggestions on how to positively stop this habit. I have tried giving him blankets to root on instead along with pillows and he only wants our arms. I had a potbelly before that we bottle fed and he never rooted THIS MUCH! Thank you!! I also take him outside to root everyday. Sorry this dosent relate to biting but this was the closest I could fine to rooting . Thank you so much… he is around 9 weeks now and off the bottle and he has seemed to stop the rooting. Oscar is so cute by the way! I am going through this right now with my 3 week old baby pig and I’ve got bruises but he only does it to me. He is also only biting me and no one else. He gets so mad at me if I’m not petting him he will charge and bit me. Isabelle is 3 1/2 months old now. She has started this biting stage, plus going after my silky terrier. She is still a little bit smaller than him in size. When she thrusts at us or our dog, I have put her in a “time out” kennel and tell her no, firmly, but when I do she becomes upset and urinates in it, knowing that she will be let out for it to be cleaned up right away. I have put her right back in afterwards, but I’m afraid that by then she doesn’t know why she’s going back in. We have had our dog for almost 9 years now so this was his house first. Any other suggestions to help keeping her from going after the dog or even us at times? This has become a daily problem. Thank you in advance. Hi Gina! We have had some really similar issues between Oscar and our dog, Rylee. Rylee is in a similar place as your silky terrier; she is older (10 years) and has always been top “dog” in our home. We go through phases with them where they battle every day and then phases where they get along and coexist fairly well. My belief is that it all has to do with hierarchy. Isabelle has probably finally decided to challenge your silky terrier for hierarchy. I used to intervene between our two and finally decided to let them work it out a bit. I’m always near them (I never leave them alone together in the house…even if I’m taking the trash out. I’ll usually put one in a crate or just take Rylee outside with me), so I never let the fighting escalate to a dangerous point. However, I’m concerned they won’t ever stop their battling until they work the hierarchy out, and the problems seemed to get worse when I was constantly intervening. Of course, if yours are fighting to a more serious level, don’t let them work it out like I have been with mine. Our biggest problem is that neither one of them will give in and just let the other one be higher in the hierarchy, so the snipping continues. I think the battles would stop if one would just give in, but they’re both really stubborn. So, for now, I continue to keep a close eye on them but let them work things out. I have stepped in a few times, but I try to hold out if the situation is still safe. If one of yours will “give in” to the hierarchy, I think the fighting will calm down. One thing to mention is that I’ve noticed a pattern with Oscar that you may or may not have with Isabelle. When my husband and I start Move the Pig with Oscar, Oscar instigates battles with Rylee more frequently. In fact, if we haven’t been keeping up with MTP and restart it (which happens fairly frequently), I notice Oscar starts snipping at Rylee within a few hours of us moving him. My guess is he knows he’s losing hierarchy with us and is grasping at any hierarchy and starts picking on Rylee to stay “above” her. After a few more days of MTP, the frequent battles between them slow down to normal again. But, it’s something I always know to count on when we restart MTP. The kennel situation is frustrating and, since you’re having trouble with that, I would just see if letting them work through things helps. If Isabelle is determined to be “top dog” with your silky terrier, she will likely continue the challenges, despite putting her in the crate, so I wouldn’t even stress yourself out with putting her in there and then dealing with her urinating in it. Here is a post about Oscar and Rylee and their little battles that might be helpful: http://lifewithaminipig.com/our-mini-pig-and-dog-are-enemies-again/. It’s so hard to watch your two “kids” battle and challenge each other, so hopefully they can start to work things out. My mini pig bit me and broke the skin do I have to worry about anything? It was my fault she bit me. Recently my mother and father in-laws were at my home. My father in law was in the kitchen cooking. I went to go by with my miniature pig Porkchop and he went for my father in laws leg. No teeth just mouth. He is one year old and he was neutered young. He is my baby. He has never done this to me for say, unless he doesn’t want to be moved and I don’t get intimidated I say no and shout let’s go and do the move the feet or stomp and he usually goes. He acts almost over protective at times. He is usually by me and if someone gets close to me he charges. He just did it to my daughter. I said no and I said that’s bad boy and swiped his nose. She didn’t feel teeth just lips and wetness. She made him do tricks after a while and gave him treats. He does this with new comers to the home is it protection over me or is it unsureness of the person? I am going through the same thing with my 9 month old pig, piggy smalls. I am the only one she will not bite, shes biting my husband and she is biting everyone that comes in my house, please help we love her so much and want to know the correct way to correct her biting.??? My mini pigs name was Oscar, he was a Julieanna and a member of our family. He use to nip as a baby, we use to feed him treats by hand. We stopped that and the biting also stopped. Oscar was a sweet boy. He would lick my toes so I would give him belly rubs. He went to work daily with my husband, went on walks with my son. He would have visitors to his outdoor playpen all the time. Saturday morning I Got up to let him out. He ran the wrong direction so I followed to redirect him to the correct area. He charged me and jumped up and knocked me down. He then attacked me with his tusks that had grown back after we trimmed them when he was a baby. The attack was brutal. He would not stop attacking. My yelling finally woke the other members of my family who saved me. I lost over a pint of blood and ended up in the hospital. This was not my dear boy at all. Don’t know what happened. Oscar lost his life, we had to put him down. The attack was too bad. I am so sad wonerding, what could I have done differently. I miss him so much and wish I could have done anything else. Anyone have any ideas? Question. I have a pig about 5 month male neutered about 3 weeks ago. He is having an issue with biting anything wood in our home. Like the coffee table, legs of the chair, even the base board heater. I’ve tried no and redirecting but it’s not working. Any tips or other things I could try? My male neutered pig is around 5 months old. We have had him for a month. He had no problem crawling on my lap and cuddling for rubs until recently. He will crawl on my lap and when i move my arm down and it brushes the sides of his face, he snaps at my arm. Not sure if he is getting spoiled or why he would be doing this all of the sudden. Boudin (boo-dan) is my neutered male pig. He is 10.5 months old and I have been battling biting issues with him for several months now. He almost always breaks the skin and leaves bruises. I have tried firmly saying “no bite” and that didn’t phase him. I then went to firmly and loudly saying “no bite” while tapping him on the snout. So now when he bites me he immediately turns his head and/or runs out of arms reach. I have tried putting him in his pin in a “time out” and that hasn’t changed his behavior either. I have no idea what to do to make him stop biting but I have to make it stop.